Welcome to PESMastery Playing Styles Guide. ‘Playing Styles’ refer to, well, the style of play adopted by the player. This can be found in the rectangular box below the player’s rating. 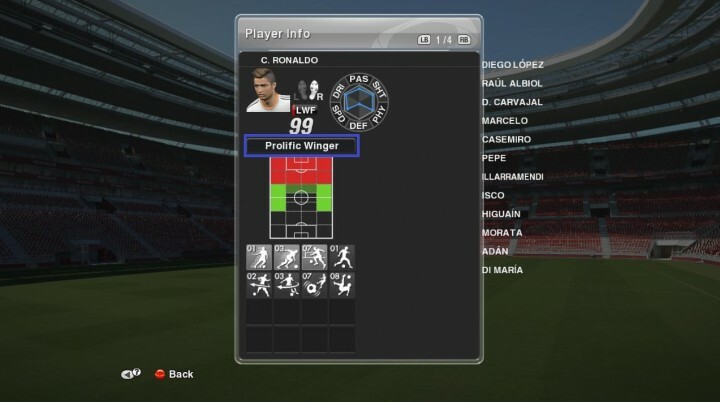 Not every player in PES 2014 is assigned a Playing Style. Playing Styles is categorised under PES Player Index Cards. Another type of Player Index cards is ‘Player Skills’. ‘Player Skills’ are the dribbling and technical skills which the player possess that allows them to pull off a skill successfully. These are indicated by the cards with numbers and icons below the preferred position of the player. This guide focuses on Playing Styles. For information on Player Skills, please refer to this PES 2014 Player Skills tutorial. 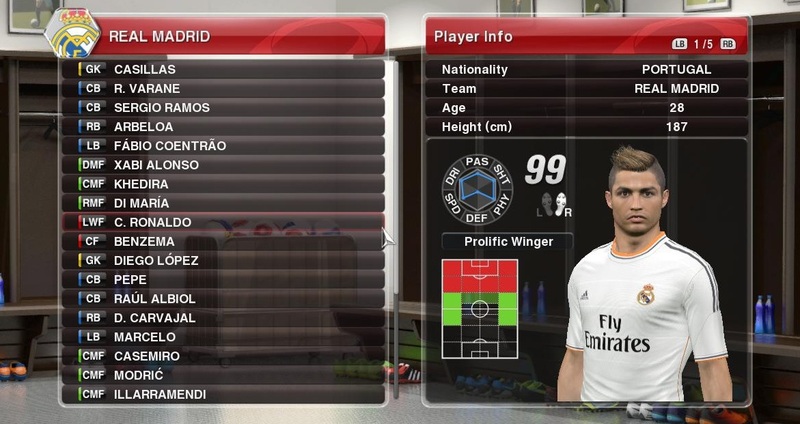 There are 18 different types of playing styles in PES 2014. Tip: Place these players in an advanced striking position and send through balls for them to chase. Tip: These players make good CF and SS. The AI will automatically make them run away from their original positions, drawing defenders away and create space for the player you are controlling. Tip: Just keep them in the box and pass the ball to them both in the air and on the ground. They have fast reactions and are able to take shots quickly in the box. Tip: As much as possible, send high balls into the box for them to head towards goal. Their strength also allows them to shield the ball while other teammates make forward runs past them into the box. Tip: I use these players to dribble and attempt through balls to my strikers. Tip: With their high speed, dribbling and shooting ability, you can easily use them to cut in from the wing and take shots at goal. Use the Combination Play ‘Cut Inside’ with these players for best effect. Tip: Use these players to make through passes and chipped through passes. Their passes are a nightmare to defend against. Tip: These players are good at dribbling. Use them to keep the ball and create space for your other teammates. Tip: You will notice these players everywhere on the pitch. Play them in CM or DM to boss the midfield. Tip: If your opponents are using tall and strong attackers, you will need these players to match their strength and stop them in their tracks. Tip: I find that this is one of the most important player on the pitch. They somehow possess the ability to win the ball back effortlessly. Tip: These players are rather similar to those under ‘Classic No. 10. What I do is to use them and send through passes forward. Tip: This is a new playing style in PES 2014. I don’t think this style is really important in your team. Tip: I love these players. These CB usually make late forward runs, often unmarked, into the box. Spot these runs and play the ball to them and take a shot on goal. The runs will usually be automatic, although you can also trigger their forward runs with L1+Right analog stick too. Tip: Send in crosses from deep with these players. If you have Dani Alves or Maicon in your team, you can also try taking long shots. Just have to beware of counterattack as you have committed too many players up front. Tip: Want to prevent counter attacks, these full backs will be useful as they will never venture upfield to attack. Tip: I am not particular about the offensive / defensive nature of my goalkeeper. Usually at any time on the pitch, I will avoid having 2 players with similar player style, as they will get in each other’s way and there is little variation in your attack. You can’t have 2 Fox in the Box, or 2 Target Man, as this makes the penalty box a crowded place. One exception will be ‘Prolific Winger’, as in the case of Bayern Munich with Robben and Ribery. In general, I will try to have a variation of playing styles in the starting 11. Key Playing Styles essential for your success are ‘Box to Box’ and ‘Anchor Man’. The game is usually won in midfield, and by having these 2 players in your team, your midfield will be strong enough to face most teams. What is your preferred Playing Style? I hope you find this guide useful. Do you have any preferred playing styles which you feel are crucial in any team? Let me know in the comments section below. Thanks and enjoy your PES 2014! You place your player between the ball and the opponent, and push the right analog stick against your opponent. Trickster is an AI-controlled skill card. When you are playing against the AI and they have a player with the skill card, he is more likely to perform dribbling skills.